I found this yesterday in the £3 bookshop on Bristol’s Park Street. It’s clearly inspired by Howard Zinn’s A People’s History of the United States, which told the story of the US as it affected ordinary working, blue-collar Americans and other marginalized groups, like Blacks and the indigenous peoples. It challenged the dominant, right-wing narrative of how America was founded by rich, White, and immensely wise Founding Fathers as a uniquely just society. Zinn has since passed away, but his book inspired Colin Firth’s and Anthony Arnove’s collection of radical British historical texts, The People Speak: Democracy Is Not A Spectator Sport. Contemporary scholarship has superseded some of Zinn’s work, paradoxically showing that in some areas such as ethnic minorities, his opinions were too moderate. But the Republicans still utterly despise him and his book. Looking at one right-wing website I found a list of books its readers hated and considered harmful to America. Zinn’s was one of them. An engaging, critical synthesis of 20 years of new scholarship in environmental and labour history, this book tells a new story of the emergence and power of environmentalism as a movement forged by common people in defence of their lives and livelihoods. Countering previous arguments that environmentalism began in post-World War II middle-class suburbs, Montrie redefines environmentalism as a grass-roots, working class response to industrialization and urbanization dating from the early 19th century. From the start, this movement included workers’ resistance to elite attempts to control nature both for profit and for upper-class leisure. Montrie narrates the growth of working-class environmentalism and its successes and failures from the textile mills of New England, to the Chicago streets around Hull House, to automobile plants of New England, to the coal mines of Appalachia, and to the agricultural fields of California, with other stops along the way. 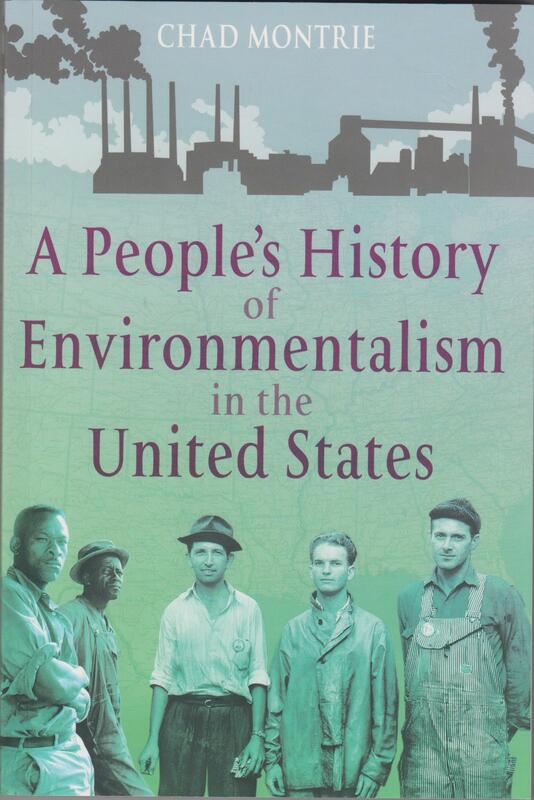 This detailed by accessible book offers a forceful new interpretation of American environmentalism and rewrite the narrative of the modern environmental movement. The Republicans and the corporate backers fear and despise the Green movement, denouncing it as a strategy for introducing redistributive taxation and Socialism by the back door. They hate the way Greens recommend that rich, polluting industries should be taxed, and clean, non-polluting energy sources – like solar, wind and wave energy – should be developed to replace fossil fuels. These have got to go, as the Republicans and Libertarians are funded and bought by the Koch brothers and other oil and fossil fuel magnates. And when the Republicans and the corporate paymasters aren’t foaming at the mouth about environmentalist ‘socialism’, they’re claiming that it’s another form of Nazism, because the Nazis were very keen on protecting the German environment. Well, they were, and this had been a major part of the German racist, volkisch movement since the 19th century. But this doesn’t mean that environmental per se is simply Nazism under another form. Where it appeared in Britain and America, it was an attempt by working people and the authorities to protect the environment and allow ordinary people to live clean, healthier lives and enjoy the beauty of the countryside in which their ancestors had lived and worked. Hitler would have liked the Nazis to have been a party of the working class, but he hated organized labour. The first thing the Nazis did when they seized power was smash the German trade unions. But as this book shows, after the War American trade unions played a major part in the Green movement in the US. Which also explains why the Republicans go bug-eyed about the Greens and Socialism. The environmental movement and its connections to organized labour and the American working people marked a challenge to capitalism and the power of big corporations, not just to exploit the environment, but also to exploit the blue-collar, working women and men, who claimed their rights at work and to enjoy America’s great scenic beauty. Another strand of their ideological attack on the environmental movement is to claim that it’s pagan, and so Christians should have nothing to do with it. It is true that much modern, Neopaganism is centred on the worship of the earth mother, and that pagans have been particularly environmentally conscious since the emergence of Green movement in the 1960s. But Christian writers were describing the beauty of the natural worlds and the wonders of its creatures as evidence of God’s providential handiwork from at least the Middle Ages onwards, and I’ve seen absolutely nothing to suggest that caring for the environment in itself is at all antichristian. Indeed, some theologians have pointed to Jean Calvin’s belief that as God has given human stewardship of the Earth, they have a duty and responsibility to protect the environment. I haven’t really had time to read the book properly yet, but I will have to. Trump and the big corporations which control him are a real, present threat to the environment, working people, and indeed the future of the Earth and humanity, just as the Tories and their paymasters are over this side of the Pond. We have to protect both in order to create a better future and preserve the planet. This is a bit of regional interest. This is a clip from an American programme about different accents in America. It’s about the folk in the fishing communities in North Carolina, who speak with a very marked accent derived from their British and Irish ancestors. The blurb for it on YouTube says that they sound West Country – Cornish and Bristol. With ‘oi’ sound for the ‘i’ in standard English – they say ‘hoi toid’ instead of ‘high tide’, they actually sound more East Anglian to me. We were taught when we were studying American history at College that most of the British settlers of New England came from that side of the country, and the local dialect is similar in some ways to American English. For example, like Americans they call autumn ‘fall’, and as in other British and Scots dialects the ‘u’ sound is pronounced ‘oo’. So ‘dune’ is pronounced ‘doon’, and the man’s name ‘Hugh’ is pronounced ‘Hoo’. However, very many people from the West Country and Bristol did emigrate to the nascent British colonies in the 17th and 18th centuries. I think there are 30 towns and cities called Bristol in the US. One of the local presses in Cornwall has also published a book on Cornish emigrants to the US. This weekend I put up a piece about the arguments for religious toleration advanced by William Penn, the great Quaker apologist and founder of Pennsylvania. Penn believed passionately in religious toleration, and was himself, along with one of his fellow Quakers, imprisoned and tried for his religious beliefs. His trial, and the way it violated the natural liberties of the English people, were the subject of one of the three pamphlets he wrote attacking religious persecution. Williams has long been regarded as one of the first exponents of what were to become central principles of the American constitution: the sovereignty of the people and the separation of church and state. David Wootton, ed., Divine Right and Democracy: An Anthology of Political Writings in Stuart England (Harmondsworth: Penguin 1986) 215. Wootton’s book contains extracts from The Bloudy Tenent of Persecution, including the following passage, where Williams lays out the main themes of his argument. First: That the blood of so many hundred thousand souls of protestants and papists, spilt in the wars of present and former ages for their respective consciences, is not required nor accepted by Jesus Christ, the Prince of Peace. Secondly: Pregnant scriptures and arguments are throughout the work proposed against the doctrine of persecution for cause of conscience. Thirdly: Satisfactory answers are given to scriptures and objections produced by Mr Calvin, Beza, Mr Cotton, and the ministers of the New England churches and others former and later, tending to prove the doctrine of persecution for cause of conscience. Fourthly: The doctrine of persecution for cause of conscience is proved guilty of all the blood of the souls crying for vengeance under the altar. Fifthly: All civil states, with their officers of justice, in their respective constitutions and administrations, are proved essentially civil, and therefore not judges, governors, or defenders of the spiritual, or Christian, state and worship. Sixthly: It is the will and command of God that, since the coming of his Son, the Lord Jesus, a permission of the most paganish, Jewish, Turkish, or anti-Christian consciences and worships be granted to all men in all nations and countries; and they are only to be fought against with that sword which is only, in soul matters, able to conquer, to wit, the sword of God’s spirit, the word of God. Seventhly: The state of the land of Israel, the kings and people thereof, in peace and war, is proved figurative and ceremonial, and no pattern nor precedent for any6 kingdom or civil state in the world to follow. Eighthly: God requires not an uniformity of religion to be enacted and enforced on any civil state; which enforced uniformity, sooner or later, is the greatest occasion of civil war, ravishing of conscience, persecution of Christ Jesus his servants, and of the hypocrisy and destruction of millions of souls. Ninthly: In holding an enforced uniformity of religion in a civil state, we must necessarily disclaim our desires and hopes of the Jews’ conversion to Christ. Tenthly: An enforced uniformity of religion throughout a nation or civil state confounds the civil and religious, denies the principles of Christianity and civility, and that Jesus Christ is come in the flesh. Eleventhly: The permission of other consciences and worships than a state professes only can, according to God, procure a firm and lasting peace; good assurance being taken, according to the wisdom of the civil state, for uniformity of civil obedience from all sorts. Twelfthly: Lastly, true civility and Christianity may both flourish in a state or kingdom, notwithstanding the permission of divers and contrary consciences, either of Jew or Gentile. I realise some Jews and Muslims may object to the tone of his comments about them, that they are somehow a threat to the Christian community and Christians should endeavour to convert them. Nevertheless, the points Williams is trying to make are good ones: provided that everyone in a community obeys the same laws, it doesn’t matter what their religious opinions are. In the case of the Jews, the underlying point can be stated more generally: no non-Christian will want to convert to that religion, if it offers them and their people nothing but persecution and hate. It also needs to be pointed out, that Williams was writing at a time when the Turkish Empire did represent a militant threat against the states of Christian Europe, which Williams would have been acutely aware of. It can’t be argued against his demands for religious freedom and pluralism, that he was living in a more peaceful time. I’ve put this up because this is one of the founding documents of the great American tradition of religious freedom and tolerance, from one of the Puritan divines who also was one of the great pioneers of American democracy. This is now threatened by Trump and his proposed registry for Muslims. As I pointed out yesterday, this violates the argument for freedom of conscience argued on Christian theological and scriptural grounds by William Penn, just as it violates Williams own arguments on the same grounds for religious toleration. Trump’s claim to be protecting Americans through this registry not only violates due process, as George Takei, Star Trek’s Mr Sulu, made clear, it also violates the essential theological principles on which America as a tolerant, democratic, Christian nation was founded. If the religious Right are supporting his motion for this registry, then they are showing a complete ignorance and contempt for one of the cornerstones of American and British Christianity and liberal democracy.